Eight o’clock in the morning we started our ride with Martina. It was pretty awesome that she decided to join me for the morning. It’s so much easier and so much different, when someone is just accompyning you on the way. Martina cycled with me towards the border and after the border I had to deal with the rest of the road on my own. 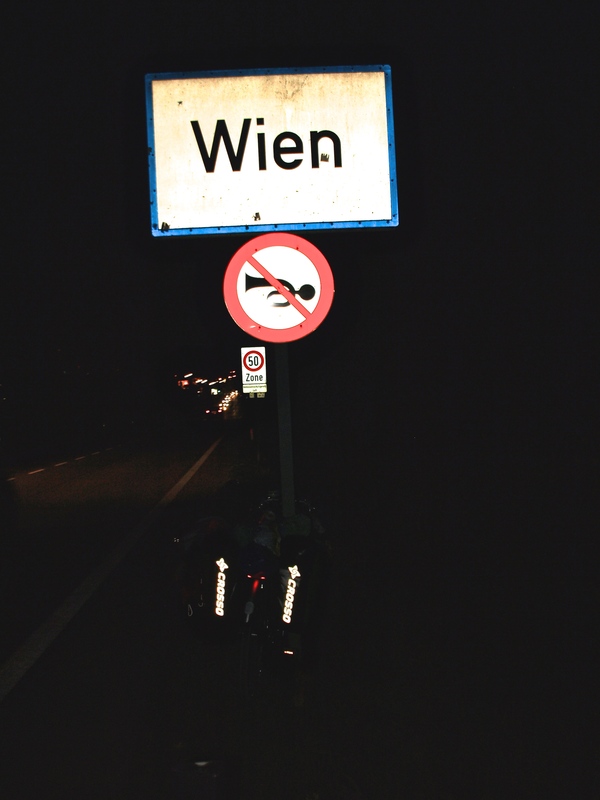 And it was pretty amazing when I saw the sign EuroVelo No 9 signed “Breclav-Vienna” and instead of cycling along the directions I planned, I just followed the signs. It was pretty amazing as I actually didn’t have to check the map! So I was just looking at the signs and cycling. Which after a few hours turned to be a bit… boring? The road had lead me mainly via the fields (and not via the villages), so all you can look around are.. fields! But it was a good experience to know how it does feel like! Austria – here I am! Athens – only 1467 Km to go! That was one of the saddest moments of the journey. That was the moment when I realized that I had lost my pink jacket on the way between the border and 35 kilometeres after the border. And I had no chance to go back and look for it. I knew I still had some 60 kilometeres to go, so I didn’t have enough time to go back to the border and then once again back towards Vienna. If only there was no elections during the following day in Poland, I would have surely cycled back to Breclav and only the following day to Vienna. The jacket was a gift from my sister and I just loved it. I loved its color and I loved the way it made me smile every time I was wearing it. I loved it as one of the very few things I’m carring with me in here, so each of them has a special meaning to me..
And I know it’s just a thing. And I know it’s just a jacked. It’s just that it really made me feel sad. It started getting dark around 6 pm. And it’s not much fun to cycle in the night time. At least not for me. And especially when entering the big cities. It’s kind of a problem, becasue they don’t really have small roads to enter the city, only the highways or fast speed ways. So I didn’t have much of a choice and I cycled along such fast one.. I was probably not allowed to do that, it was also no fun at all and I cycled as fast as I could to be already in the city, because I feel much safer inside. There were some people on the roads that were bumping at me and yelling from the open doors (in German as you can imagine, so at least I could not understand them). So, my dear friends, if you happen to meet a cyclist on a fast way road, I can assure you, that it’s not someone who is doing it for fun, but probably someone who didn’t find another way and is scared to death. So be at least that nice and don’t bump at him/her, it doesn’t help at all. Another 20 Km cycling across the city. Two more hours. But I did it! Mission completed – I reached Matt’s flat. I had a vision of Sunday rest just ahead of me.